This recipe was introduced to me by the Baron's Aunt Judy. I loved the combination of sweet potatoes and apples all baked together with cinnamon and nutmeg, which ties both together so well. The topping of brown sugar, PLUGRA butter, pecans and marshmallows made it more like a dessert, which is never a bad thing! 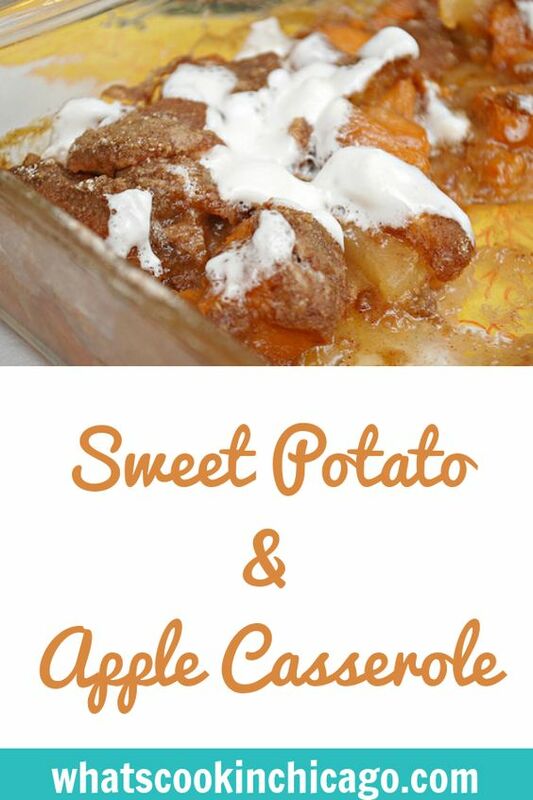 I typically make half the recipe for Joel and me to enjoy but you can easily double the recipe too for other sweet potato fans! Place sweet potatoes in a large saucepan and cover with water. Bring to a boil and cook for 25 minutes or until tender, but firm. Drain, cook and cut into bite sized pieces. Transfer potatoes to prepared baking dish with apples. 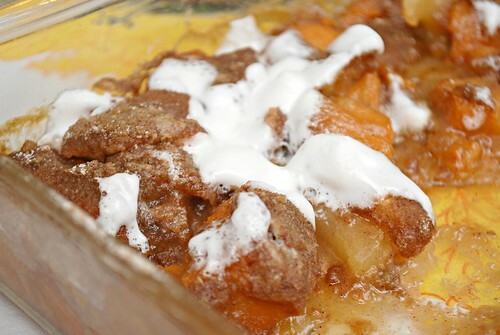 In a small bowl, combine the brown sugar, cinnamon and nutmeg; sprinkle over sweet potatoes and apples. In a medium bowl, prepare the topping and combine the flour, brown sugar, PLUGRA butter and pecans; sprinkle over the sweet potatoes and apples. Scatter the top with marshmallows. Bake dish uncovered in the preheated oven for 30 minutes or until lightly browned. You had me at marshmallows- yum! Mmmm I love a sweet casserole. Anything apple is cool in my book! Dudette isn't a fan of sweet potatoes either, unfortunately, but Hubby and I love them, especially when not overly sweet. I think your casserole sounds perfect, with the hint of tartness from the apples. Sounds like a heavenly combination! I can see it as the perfect side for Easter ham, Thanksgiving or any ol' day of the week! This is the perfect holiday side dish! Love the addition of apples. What a classic, yummy combination! I wish I had a bowl of it in front of me right now!